Is there a connection between juice and tooth decay? I can’t tell you when it happened, but at some point in the last year my baby morphed into a walking, talking toddler. Shortly after we celebrated my son’s first birthday, his daycare informed me that he’d be graduating to the toddler class, where they had juice with their snacks. Worried about his sugar intake, I politely asked his teachers to only give him milk or water—no juice. Did I needlessly restrict his drink selection or did I save his budding teeth from future decay? The answer depends on what type of juice the daycare is serving. 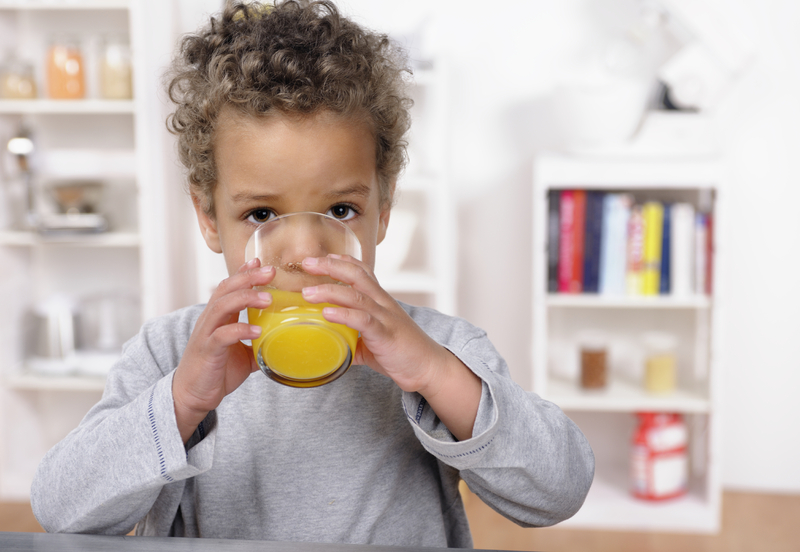 A new study from the American Dental Association (ADA) looked at preschoolers’ consumption of 100% juice and whether or not it caused tooth decay. Surprisingly, there were no significant findings between 100% fruit juice consumption and decay. Choose only 100% fruit juices. While it’s true that 100% fruit juices contain the sweet stuff, their taste is due to natural sugars. 100% juices are always a better choice than fruit-flavored juices containing artificial, added sugar. Remember that because of labeling laws, “made with 100% real juice” does not necessarily mean that the drink contains only natural juice. Read the label carefully to see if sugar, artificial flavors, or other substances were added. Avoid all-day sipping. Juice can be healthy in moderation, but it often has as much sugar as soda. This sugar — found even in 100% fruit juice — fuels cavity-causing bacteria in kids’ mouths. This is especially true when children sip on juice throughout the day. This is a big problem in young children because the hard surface of baby teeth — enamel — is thin, making their teeth vulnerable to sugar’s harmful effects. Enjoy juice at mealtimes only. Limit juice and other sugary drinks to mealtimes only—breakfast, lunch or dinner. This minimizes the time a child’s teeth are exposed to sugar and allows the mouth to naturally clean itself of the “bad” bacteria. Then, between meals and especially at bedtime, a child should have only water. Brush and floss regularly. A regular dental routine will keep your child’s mouth clean and keep those cavity-causing bacteria at bay. The health of baby teeth – good or bad – carries over to adult teeth. Serve 100% juice in moderation to keep little smiles healthy and bright! Don’t let your baby go to bed with a bottle of juice! Unless you plan on waking up a sleeping baby to brush those sugars and acids away stick with water. Like anything, juice is fine in moderation. I’ve heard that the sugar content in juice can make anyone’s tooth enamel rot. It seems like a good idea to particularly stay away from juice that has added sugar. Personally, I think that making sure that your kids drink juice that you’ve pressed yourself is the best option. It also seems like good advice to make sure that your kids drink juice only every once in a while, rather than have them drink juice throughout the day. Making sure that they drink plenty of water and cutting down their sugar content is a good way to make sure that your kids’ teeth stay healthy and clean. Thanks for your feedback, Deanna! Cutting down on sugar is a good idea at any age. Basically, kids should avoid juice when they can. I think that really applies to all of us. As you said, it can be damaging to your teeth, especially if it isn’t 100%. Do you have any other tips about children’s oral health? Thanks for the comment, we agree! Yes, check out these blogs on children’t oral health.